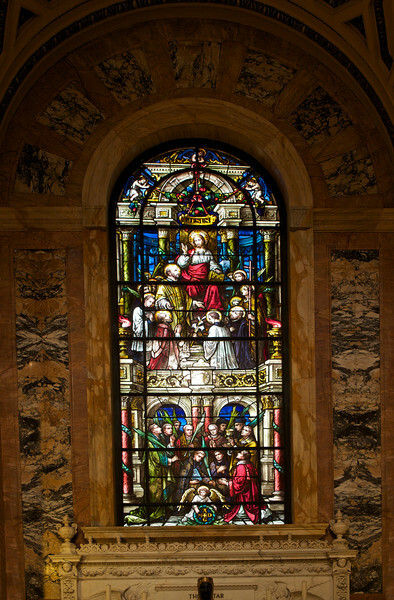 This window shows, in its upper Order, Ignatius and other Jesuit saints gathered around their Lord, whose name they bear (Jesuits represent the Society of Jesus). The lower Order depicts all of the Society's Blesseds and Martyrs, bearing palm branches denoting their sufferings and victories. The artist that created the work is not known. Thanks to Father George Witt for the information on the stained glass windows. I like how this photo shows the wonderful marble patterns surrounding the window. From the church website: "Enhancing the church’s interior dynamism are the rich and diverse colors and textures of the European and African marbles with which the walls are revetted. The wainscoting and pilasters throughout the church are covered in red-veined Numidian marble. The majority of the wall panels are Yellow Sienna, though some panels are the black-flecked Sienna brecciata. The door frames and frames for the Stations of the Cross are done in light grey Convent Sienna marble. Throughout the church, but especially notable in the sanctuary, these marbles are outlined and separated from one another by inserts of varying shades of red Jasper. Most of the marble work in the church was done by Betterson and Eisele of New York."